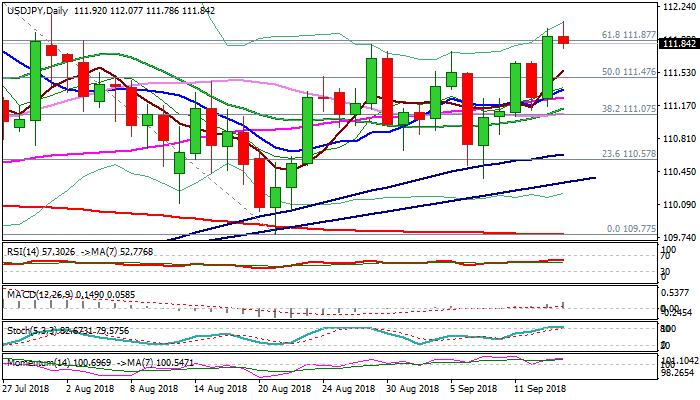 The pair eases from new six-week high at 112.07 on Friday, consolidating strong rally of 0.61% previous day, when strong bullish signals were generated on break and close above daily cloud top 111.58) and key Fibo barrier at 111.87 (61.8% of 113.17/109.77 fall). Bulls are taking a breather ahead of next strong barriers at 112.15 (01 Aug high) and 112.37 (Fibo 76.4%), with deeper dips anticipated on pre-weekend profit taking. Bullish daily / weekly techs and dollar’s positive sentiment suggest further advance, with another positive signal seen from long bullish candle on weekly chart. Corrective dips are seen as positioning for fresh upside, with broken cloud top (111.54) expected to contain. Caution on narrowing daily cloud which twists next week and may trigger deeper dips.